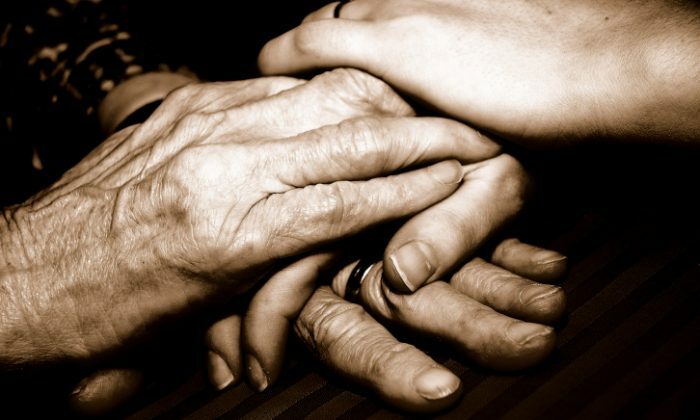 The simple act of holding your loved one’s hand may be more powerful than it seems, especially for those in pain. According to a study by researchers at University of Colorado and University of Haifa, when couples hold hands, their brainwaves sync, and pain is eased. The study looked at 22 heterosexual couples between 23 and 32 years old who executed two-minute scenarios, including sitting together without touching, sitting together holding hands, and sitting in separate rooms. Participants then repeated those same situations while mild heat pain was inflicted on the female partner’s arm. During all scenarios, both partners’ brainwaves were monitored with electroencephalography (EEG) caps. “We showed that the level of pain with touch was correlated to the level of the partner’s empathy,” Pavel Goldstein, a postdoctoral pain researcher and the study’s lead author, told Healthline. When the couples were together, whether they were touching or not, their brainwaves synchronized in a wavelength associated with focused attention. However, this wavelength synced most when they held hands while the woman was in pain. “Previous studies show that we can communicate our emotions by touch. For example, one study asked people to touch a person with a specific emotion in mind, such as sadness, and the person being touched had to guess the emotion, which they were able to,” Goldstein said. David Linden, a professor of neuroscience at the Johns Hopkins University School of Medicine, says the study’s findings are reasonable given what’s known about pain perception. “The thing to realize about touch in general and pain more particularly is that these signals come in from the body to the spinal cord and up to the brain and they split into two different places,” Linden told Healthline. One place in the brain, which is called the somatosensory cortex, is involved in recognizing the facts of pain, such as where the pain is happening on the body, what type of pain is occurring (throbbing, burning, etc. ), and how strong the pain is. The other part of the brain, called the posterior insula, is where the emotional aspect of pain is relayed. “This is what makes pain feel bad. We think of pain as being intricately feeling bad, but that is a trick our brain plays on us,” Linden said. While the facts of pain are unable to be changed by things like analgesic drugs, meditative practice, distraction, empathy, or healing touch, Linden says the emotional component of pain is. “The posterior insula receives input from all kinds of different brain areas. This is why pain perception is so easily affected by other phenomenon,” said Linden. He points to battlefield stories of soldiers in combat struck by shrapnel who don’t realize they were hit and continue to fight. “They see blood on themselves and they think it must be from some other guy. It’s not like soldiers are super humans. They are normal people put in extraordinary circumstances. What this points out is that through other factors, such as emotional or attentional, you can diminish pain or even heighten it,” Linden said. When it comes to the hand-holding in the study, he says that the feelings of being soothed and loved with touch can blunt pain a little in the same way that people control pain with breathing exercises or meditative methods. “These things have their limits, though. They can’t eliminate the pain, but they can take the edge off,” said Linden. Having a synced brain with your partner sounds magical. However, Linden says there’s nothing unnatural about the study’s scenarios. “If I have two people in two different rooms, then I put them together in the same room and [have them] watch the same TV set, their brain waves will sync up,” he said. He compares it to dangling a microphone over the center of a football stadium from a helicopter and hearing the roar of the crowd. If you delved into this, he adds, the degree to which the brains synced up might not be noticeable to the eye and would mostly likely require math to detect. The fact that this is the first study published about brain wave synchronization connected to pain and touch-induced analgesia makes Goldstein believe it’s extraordinary. “We were unique in trying to look at what happens in the real interaction of people,” he said. The study is also the latest research on a phenomenon called interpersonal synchronization, which occurs when people physiologically mimic each other, from gestures to heart rate to brain waves. While Goldstein says more research is needed to understand how brain coupling could reduce pain, he points to previous research that shows that empathetic touch can calm a person, and in turn could activate pain-killing reward mechanisms in the brain. “We live in an interesting time because we use technology as a communication tool most of the time, and physical contact has become rarer. This study shows the importance of touch and that [it’s possible] we underestimate some benefits of physical contact,” said Goldstein. For now, he says, if your loved one is in acute pain, try holding their hand or giving them a hug. Cathy Cassata is Chicago-based freelance writer. This article was originally published on Healthline.